Everyone who works with you at Spin Zone is a cyclist, and understands cycling from many different perspectives. We ride trails and asphalt, we race and we ride just for fun. Some of us started cycling later in life, some early. We use cycling to control weight, stay fit, and to win races. We were all beginners once, so we welcome all questions. Every customer is important to us regardless of ability or disability. We share a passion for human power, and that makes us all equals. Check out the Meet Our Staff page to read about our employees, how they can help you in the shop, what type of riding they enjoy, and their favorite bike rides. 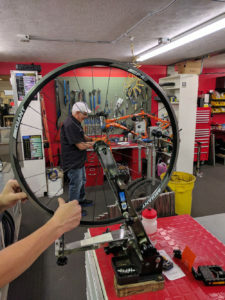 Spin Zone Cycling Outfitters is actually under the umbrella of Sportcrafters, Inc. Sportcrafters was created about 15 years ago by Pete Colan, and is continuing to grow today. You would recognize our products as CycleOps Pro Rollers. As an added benefit to you, the customer, we understand the bicycling industry from both sides. We have zero tolerance for poor design and quality, and only carry brands from reputable manufacturers who prove to give the best support to their customers as we do. Come take a tour of the Sportcrafters (CycleOps Rollers) machine shop, located in the same building as our store. If you have a unique repair situation, we welcome every challenge, even if we have to fabricate parts ourselves. Ask our customers – we have fixed treadmills, homemade bikes, and items with outdated parts. Professional powder coating services are also offered on the same premises by Shelton Powder Coating. We focus on service in every aspect of the store – from the highest quality customer service to professionally performed repairs. At Spin Zone, your equipment will be properly selected and fitted for your unique needs through an extensive interview, test rides, and professional fit process. If we don’t have what you need, we will get it for you. We do not pressure you to purchase anything. We do not work on commission. Instead, we insist that you test ride, compare, and challenge us for the best fitting equipment, clothing and accessories to meet your unique need. We back up our commitment to our customers with lifetime support of the products we sell. With every new Spin Zone bicycle we offer lifetime free adjustments. No appointment is necessary, and no minimum or maximum number of visits. We also offer warranty support of all products we represent and sell, including shipment to and from the manufacturer or distributor. We service all bicycles, whether purchased at Spin Zone, another shop, or your local garage sale. We insist on inspecting your bike with you, so we both know what work needs to be done. We will offer advice based on your needs and budget, and will always be truthful with our assessment. There will be no surprises, and never charge for the inspection. We will do our best to give you on-the-spot service. For the more difficult repairs, or if special parts are needed, we will do everything in our power to get parts immediately and complete the service promptly. We specialize in difficult repairs, upgrades and modifications that most other shops turn away. We understand most bikes from a designer’s point of view. There’s very little we cannot do, so please don’t hesitate to challenge us. Our goal is that you get the best performance and enjoyment out of the right cycling equipment, accessories, clothing, and nutrition products. We don’t discourage you from shopping the internet, department stores or eBay, and we are happy to offer whatever advice we can, but caution that the wrong product at the best price is still…the wrong product.